Susan was born in Nairobi Kenya on August 8, 1992. She grew up in a poor but loving family. Then, when she was six years old, the unthinkable happened. Her father was murdered by his brothers who wanted to take his land. In an instant, she and her mother lost their father and husband, and they had no livelihood. Their situation gradually became worse and worse, until her mother was unable to provide for Susan. A few years after her father's death, her mother abandoned her. 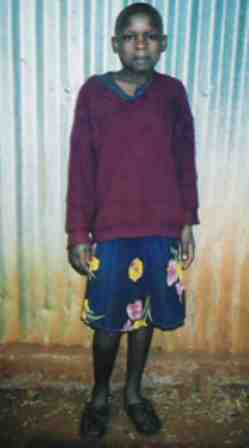 Not even ten years old, Susan was forced to scrounge for food in the streets of Nairobi. She was all alone and the feelings of hopelessness were overwhelming. During the years she was on the street, Susan felt like she had nowhere to go, no one to turn to. Then, one day in 2004, she found Gethsemane. Since that day, she has been at one of our homes learning about Jesus Christ and thriving under the love and provision of her home parents. At Gethsemane, Susan was able to attend school after missing several years of education. Even though she started well behind her age group, she has worked extra hard to catch up to her age level and became the top ranking student at the school. Susan also qualified for a prestegious Secondary School (or High School). Soon after her arrival at Gethsemane, Susan stepped forward to become a born again Christian. That decision began the greatest transformation in her life. The power of Jesus Christ in a person's life is undeniable and incredible. Please pray that Susan will continue to grow in the saving knowledge of her Heavenly Father so that she will become a beacon of light to her community. Susan, and children like her, are able to come to Gethsemane only because of their sponsors. Please consider providing these opportunities for a child in need by sponsorship.